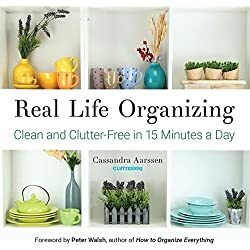 Smart, simple tips on organizing, decluttering, and time management. Download your free 10-Minute Organizing Tasks Checklist! Start taking baby steps to get organized and stay organized. Do you want to organize your home, but you don’t know where to start? Even if organizing doesn’t come naturally to you, you can use these 19 clever DIY home organization ideas to get your home in order. From organizing your closets and bedrooms to taking care of paper clutter, there are so many brilliant ideas that you can implement right away. Here’s a simple way to add extra storage space to your closet. Use some PVC pipe or a thick dowel and some twine or a decorative chain to add an extra clothes bar. 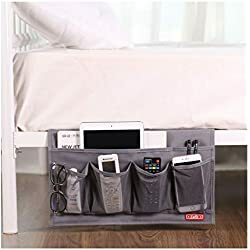 This is perfect for the kiddos, because they can reach the clothes on the lower bar. I love this idea to take advantage of unused space in the closet. Add shelving to the inside of your closet door. It’s the perfect place to store skinny items that might otherwise get lost in stacks or inside drawers. Plus, since it’s inside the closet, it would be a good starter project if you are a newbie DIY’er. Instead of cramming your leggings & tights into drawers, why not hang them up so they are easy to find? This is an easy DIY project that only requires clothespins, a hot glue gun, and maybe a piece of board. Binders are a great solution for organizing papers, especially papers that you need to access frequently. 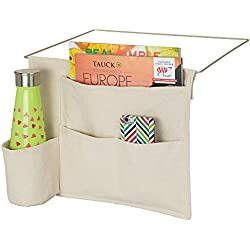 Another option for paper storage is hanging magazine holders on the wall. 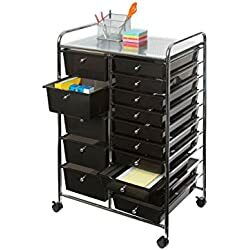 This is a great option for papers that don’t easily fit in binders. Plus, if you use wire holders, you keep the papers top of mind. If you’re a scrapbooker, you have lots of paper that needs to be organized and stored wrinkle-free. Plastic stacking trays on shelves will help you do just that. A painted pegboard can be a decorative element and add storage space for hanging items. Bedside caddies come in all shapes & sizes. They are perfect for keeping your phone, books & magazines, and remotes handy without cluttering up your nightstand. This video has some brilliant organizing hacks for the bedroom. 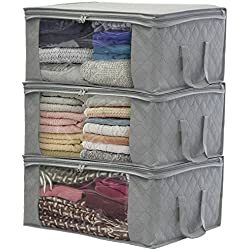 If you have one of these vertical shelves in your closet, use canvas bins as a substitute for drawers. It’s much neater than simply piling stuff on the shelves! 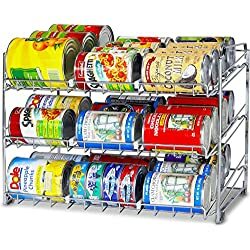 They also work great on horizontal shelves. I love these shelf dividers for wooden shelves. They would be super-easy to DIY with decorative shelf brackets turned upside down. This is such a cute idea to organize kids books! 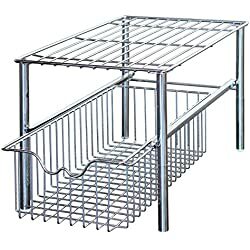 Simply add a piece of wood and casters to the bottom of a wire basket and you have a rolling book basket. Group together all the books you haven’t read yet. Then when you need something new to read, you can go straight to the to-be-read section. This is a great idea for a hall or entry-way closet. With the addition of shelves and a glass door, you can showcase your books in a mini-library. This is about as easy as kitchen organizing gets. 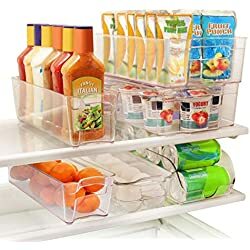 Instead of those rolling shelves that have to be installed, put your items in sturdy plastic containers that are the same depth as your kitchen cabinets. Voila! Instant slide out “shelves.” I am so doing this for my under-the-stove cabinets. This is a great way to leverage unused space in the kitchen. This no-sew ribbon memo board is mounted on the back of a kitchen cabinet door. 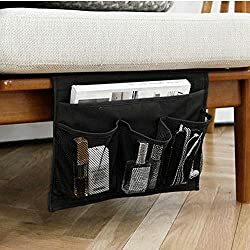 It’s the perfect place to tuck those stray coupons, permission slips, receipts, and other scraps of paper. This super-cute menu board will help you organize your weekly meal plan, recipes, and shopping list. You can get started with a wooden picture frame, some clothespins, decorative paper, and a laminator. 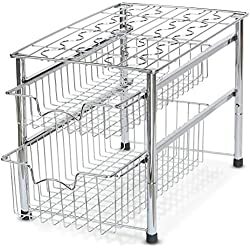 Plastic baskets are great for organizing your refrigerator & freezer. You can pick these up at any dollar store. They are great for the kitchen because they are easy to clean. I even run mine through the dishwasher. Need more DIY home organization ideas? 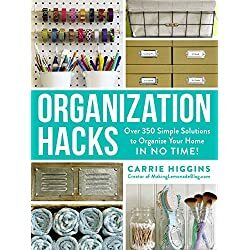 Organization Hacks: Over 350 Simple Solutions to Organize Your Home in No Time! 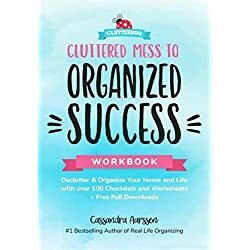 Are you ready to declutter?